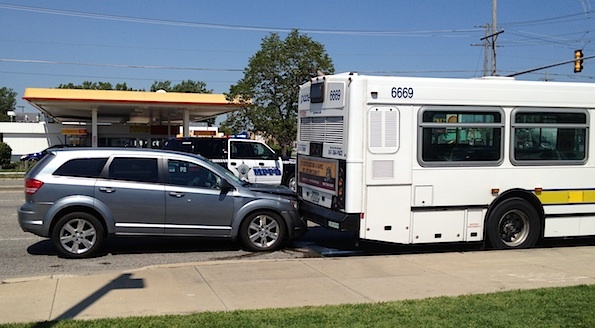 Pace Bus rear-ended today at Algonquin Rd And Elmhurst, Mount Prospect (More photos at the scene …). Mount Prospect police and firefighter/paramedics responded about 6:53:48 PM Wednesday to crash of a car into a city bus on Algonquin Road near Elmhurst in Mount Prospect. Firefighter/paramedics received a report that three people were injured. The crash was on eastbound Algonquin Road in the right lane, just west of Elmhurst Road. A silver Dodge sedan apparently rear-ended a Pace Bus near a bus stop at the corner. No word on whether people had just entered or or left the bus at the bus stop. Three ambulances responded to the crash and transported at least three people to Northwest Community Hospital in Arlington Heights. Airbags were deployed on the Dodge. Arlington Heights Fire Department firefighter/paramedics assisted Mount Prospect firefighter/paramedics. Yesterday a smaller Pace Bus was totaled when it burned near Walmart at Meacham Road and Nerge Road in Elk Grove Village. See picture at Facebook.com/CardinalEmergencies … Elk Grove Village and Schaumburg firefighters responded to extinguish the fire.